MMakalu trekking is challenging trekking in Nepal, lies in eastern part of Nepal. Makalu trek is know as Makalu base camp trekking offer superb Himalayan scenery including Mt. Everest 8848m, Mt. Makalu 8463m, Mt. Baruntse 7129m, Mt. Chamlang 7319 m and 24 snowy caped mountain of Makalu and Everest region. 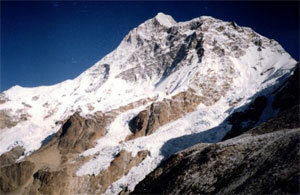 Mount Makalu is 7th highest mountain in the world and less crowded Nepal trekking destination. Makalu trekking provides stunning contrasts of high waterfalls cascade into deep gorges, craggy rocks rise from lush green forests, and colorful flowers, 440 species of birds, and 75 species of mammals, including the endangered Clouded Leopard, Red Panda and Musk Deer inhabitance of the Makalu-Barun national park. Makalu base camp trek include three high passes Sherpani Col pass (6110m), West Col pass (6135m) and Amphu Lapcha Pass (5845m) so good physical fitness required. Autumn & spring season is best time trekking in Makalu but we Apex Nepal Adventure Pvt. Ltd arrange personalized trekking service as per trekkers wish and holiday schedule. Makalu trekking begins at Tumlingtar after 45 minutes mountain flight from Kathmandu. Apex Nepal Adventure’s trekking guide led through Arun valley up to Makalu base camp then Shipton La Pass (4210 m) into the upper Barun river valley for a close look at Makalu and Chamlang Himal. After the Makalu Base Camp , ANA guide take through Nepal challenging pass Sherpani Col pass (6110m), West Col pass (6135m) and Amphu Lapcha Pass (5845m) to get in Khumbu valley to Chhukung. From Chhukung you may heading to Everest base camp or trail continue descend via Dingboche Tengboche Namche Lukla then fly back to Kathmandu. At least 4 weeks holiday required for Makalu base camp trekking but Apex Nepal Adventure arrange different options trekking in Makalu region as per trekkers choice with lifetime Journeys in Nepal Himalaya. Culture: Mixed, Sherpas, Tamangs & Rais. Day 01: Arrival in kathmandu 1334m, Apex Nepal Adventure ’s representative will transfer to hotel , Makalu trekking briefing with officially arrangements. overnight at Kathmandu. Day 02: After breakfast, our tour guide will take to for historical monuments sightseeing in kathmandu valley such as Boudhhanath: visit Bodhnath Stupa, one of the biggest Buddhist shrines in the world, where we observe Buddhist monks in prayer in the monasteries surrounding the stupa than visit Pashupatinath: the most famous Hindu temple in the country, located on the banks of the holy Bagmati River. Here you see Hindu holy men (sadhus) meditating, pilgrims bathing and occasionally funeral pyres burning on the ghats. Kathmandu durbar square: you will enjoy with different Hindus Temple , Goddes Kumari, legend of kathmandu valley because this day is required to make Makalu trekking permit with original passport. Overnight at kathmandu. Day 04 : Trek from Kahandbari to Chichila 1830m. Day 05 : Trek for Chichila to Num (1490m). Day 06 : Trek from Num to Sedawa (1460 m). Day 07 : Trek from Sedawa to Tashi gaon(2070m). Day 08 : Trek from Tashi gaun to Kauma Danda (3470m). Day 09 : Trek from Kauma Danda to Mumbuk (3570m). Day 10 : Trek from Mumbuk to Nehe Kharka via Tutu-La pass (4075m). Day 11 : Trek from Nehe Kharka to Sherson (4615m). Day 12 : Trek from Sherson to Makalu Base Camp (4800m). Day 13 : Trek from Makalu Base Camp to French Camp. Day 14 : Trek from French Camp to East Col Camp. Day 16 : Trek from Baruntse base camp (5,700m) to Seto Pokhari . Day 17 : Trek from Seto Pokhari to Ambhulabch high camp(5,400m). Day 19 : Trek from Chhukung to Tyangboche. Day 20 : Trek from Tyangboche to Namche bazaar. Day 21 : Trek from Namche Bazaar to Lukla. Day 23: After breakfast, Relaxing / Shopping or leisure day in Kathmandu and in the evening farewell dinner in Restaurant, overnight at kathmandu in Hotel..
Day 24: After breakfast, Relaxing/shopping with own activities, Apex Nepal Adventure’s representative will drop to Kathmandu international airport for onward destination.